You are currently browsing the tag archive for the ‘Weeds’ tag. Here it is, six weeks later, and some seedlings have s-l-o-w-l-y begun to sprout. The spinach has been up about a week and a half and is only now putting out second leaves. This past week some carrot and kohlrabi sprouts began to show. At least this give me some hope for the seeds remaining underground—they might spout yet. So okay, up here in north central western Michigan, you can plant as soon as the ground can be worked, but the results, like the weather, might be mixed.Six wees to sprout? Really? Kale, a very cold tolerant plant has shown no signs of germination, neither have the beets, radishes, or Swiss chard. It might work out better for me to plant some of these in late August and grow them through the fall, and just wait until about now to put other seeds in the ground. On the other hand, the annual seeds of camomile and parsley are all over the garden! They have literally turned wild and are competing with the Veronica peregrina, in other words they’ve joined the weed community. I don’t really want to pull any of them out. Perhaps the veronica would make a good ground cover on the walkways between the growing boxes? Gardening is an adventure and an experiment! My daffodils. scilla siberica, and hyacinth are all blooming, and in the wild, so are the Amelanchier trees, so I can state spring is well underway here. Doesn’t mean we won’t have more snow! However, the blueberry plants from White Flower Farm arrived last Friday and I planted them Sunday. Hope they survive. One of the first flowers every child draws in kindergarten is the daisy. Perhaps because of the simplicity of the petals’ design or maybe because the daisy shape is the first recognized as a ‘flower.’ I think we love them as children because they are cheerful, it is easy to pick a handful, and no one seems to mind the picking. There are many daisies and daisy-like flowers and all come from the huge Asteraceae family of sunflowers, mums, dandelions, dahlia, and coneflowers, to name a few. One of the most popular daisies is the roadside wildflower, Chrysanthemum leucanthemum (also Leucanthemum vulgare), or the Oxeye daisy with its white petals and yellow centers. This common daisy comes from Eurpose and the name derives from Anglo-Saxon for day’s eye. The botanical name is contradictory. Anthemum come from the Greek word ‘anthos’ meaning flower. Chrys comes from ‘chrysos,’ or gold, and leuc means white, so you have the white flowered gold flower. In some places this plant is considered a noxious weed, and although not poisonous, cows won’t eat it, so daisies in hay spells trouble for farmers. Historically, the daisy was used as a medicine and cosmetic, most often as a soothing lotion. Another common name, Marguerite or Margaret daisy, comes from the 14th century when Margaret of Anjou married King Henry VI of England. Her wedding robes were embroidered with oxeye daisies. 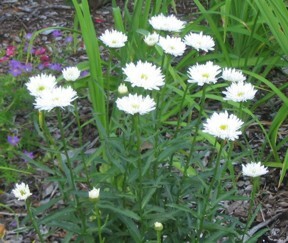 The Shasta daisy is the white daisy most of us grow in our gardens. 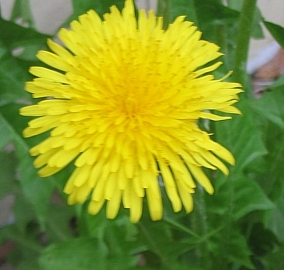 It’s flower is larger than the wild variety, and it is a bit better behaved. Luther Burbank hybridized this daisy. It used to be Chrysanthemum x superbum, but has been reclassified as Leucanthemum x superbum. As gardeners are the never satisfied with what they have, the hybridizers are developing pale yellow varieties. Easy to obtain and easy to grow, Shasta daisies deserve their popularity. They also seem to like our Michigan climate. In soils that are very rich, Shastas grow tall and lanky, and the stems fall to the ground, but here they tend to stay more compact and well behaved all season long. They fit in with almost any style of garden from formal to more natural plantings. Their colors blend with many color schemes, and can even help harmonize less compatible colors. All Shasta daisies need full sun and well-drained soil. 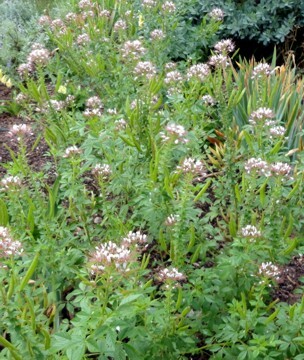 They like moist soil, but thrive in less perfect conditions. There are many cultivars available, differing mostly in height, size of flower, and when they start blooming. There are both single and double flowered types available. ‘Polaris,’ and ‘Alaska’ are two of the oldest and most common single cultivars, and remains a great garden plants. The 2003 Perennial of the Year as named by the Perennial Plant Association is the Shasta daisy cultivar ‘Becky.’ It has 3” flowers and blooms from July through September if the old flowers are removed. It’s August and the weeds are growing like there’s no tomorrow. Generally I pull weeds as I go, but at some point they always out maneuver my efforts. Suddenly I look around and weed colonies have established themselves everywhere. Weeds are any plant in the wrong place. 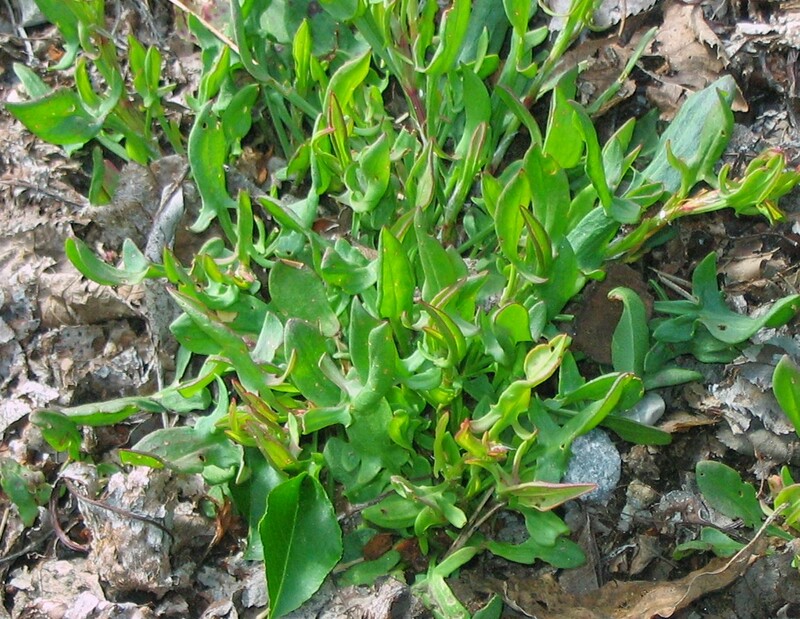 This means all the plants considered weeds like sorrel, dandelion and shepherd’s purse, and all of those overzealous plants that are prolific seed producers or determined spreaders. Right now I have an annual Cleome growing everywhere. It’s pretty and I don’t want to pull it out. There is relief from weeds, but no cure. Products like Roundup™ (generically called glyphosate) and other herbicides make killing weeds easier. Weed mats and mulch make suppressing them more efficient. However, you can’t use glyphosate everywhere, especially around water gardens, and it doesn’t work well on woody plants like vines, shrubs, and perennials with tuberous roots like iris and daylilies. Sometimes you have to use two or more applications to get rid of the weed, while any of the chemical landing on a nearby, desired plant is killed immediately. Gardeners have learned, much to our misfortune, that some herbicides while effective are dangerous. Manufactures removed them from the market. Herbicides can also be expensive. Weed mats work great for a few years, but removing them can be a hassle, as can putting down new ones in an established garden. And mulch needs replacing every year or two. I hate hoeing and find heavy mulch is more efficient, but some weeds can thrive in deep mulch. So my weeding is usually done on my knees. This also allows me to get close enough to make sure I’m not pulling out an un-established plant put in this year or last year that isn’t keeping pace with the surrounding plants. Yes, it’s come to that. When I get up close and personal, I recognize the bad seedlings and ruthlessly pluck them out. Like all alien armies, reinforcements will soon arrive, so unrelenting patrol is required to defend the garden’s ground. Some gardeners give up by this time of summer, tired of gardening. I have often done this, too, but now I’ve changed my perspective. Weeding isn’t a chore, it’s exercise; and I need to get as much of that as possible.